Without wanting to seem to obvious, Kenneth Williams was a major star of films, but not just those in the Carry On series. He clocked up 25 of the Carry On's, covering 20 years, but this was not his entire output. What follows is a listing (as far as I know complete) of the other films that he was in, whether a bit part, or as a main character. Although I will eventually include the Carry On's amongst the details here, for a professional look at the whole world of Carry On I suggest you nip over to CARRY ON-LINE, and marvel at what Andy Davison has done!!!. 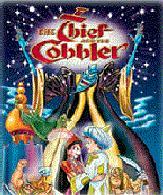 This was the first film that Brook directed, re-creating the Gay's original comic opera on film. Sir Arthur Bliss provided the music, and Christopher Fry the lyrics and some of the additional screenplay dialogue. The cast is impressive, and both Olivier and Holloway did their own singing (although everyone else was dubbed! ), but Olivier was wise to steer clear of musicals. Kenneth's role was so big that I don't even know the character's name. So far I haven't been able to track this down to video, although I believe it was released by Warner Bros.
Another role of minor importance for Kenneth in this film from 1953. He plays a window dresser at London Airport! The film is about seven English people who visit Paris and get into various comedic situations. The cast is very impressive, and if reputations are anything to go by, then this should be a very enjoyable film, but this film was made and released before the British Film Industry reached its prime with it's comedies. Again I beleive this to have been released on video by a company called Tudor, but I have not been able to track down any more details. The annual production of Handel's Messiah in a Welsh village is the cause of a fued between two families. This is the result of Cooper being given the the contralto part, a part which Thomas has sung for the last 15 years. Peace only returns when both women sing the part. Hawkins stars as a naval officer who, upon stepping ashore in New Zealand, promptly desecrates sacred ground and is captured by the natives, but after a bit of chat from him and the interpreter accompanying him, the chief is begging them to stay and teach them the ways of the white man. Hawkins returns to blighty but has to leave again due to legal difficulties, and goes back to New Zealand with his bride and has a child there. All is not well when he is then seduced by the bride of the chief, and then finds himself in the middle of a war when a white settler is killed. There is a happy ending, despite Hawkins and his bride both being killed in battle, when the chief finds their baby and decides to bring it up as his own. Tommy Steele is cast a young seafarer who ends up in Spain and is tricked into being a bullfighter for a day. 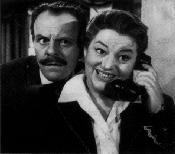 This is a comedy about a novellist, played by Terry-Thomas. His publisher, Wilfred Hyde-White, has sold his past works on the strength of publicity stunts, rather than excellent literature, but there is a twist of fate when, just before his latest book, I conquered the Desert is due to hit the shelves, T-T really does get lost in the desert and lives with a tribe of Bedouins. A bumbling group of amateur thieves steal furs and donate the proceeds to charity. One of my favourite films with Kenny in. The story follows a collection of student musicians who share a house. Kenny plays the rather odious Harold who knows he is good at what he does, and makes sure that everyone else does to. The problem with this is you start to rub people the wrong way, and Harold finds this out when he is conducting an orchestra - an excellent piece of comedy. The other of my favourites, where Kenny gives a really excellent performance, that not only show his comic abilities, but his acting abilities as well. Set in a TB sanatorium, and with all the comedy stereotypes there is, this is a subtle and moving comedy, where predicable situations can give rise to fresh twists. Quoted as a tasteless spoof of Sir Arthur Conan Doyles novel, this film stars Peter Cook and Dudley Moore as Holmes and Watson, rambling through string of jokes loosely based around the original plot. This film has been in the making since 1968, and various people have worked on it. It is an animation based on a classic story, and was the 'lovechild' of Richard Williams. The film has been finished, but to a much poorer standard that Williams originally intended, and is avaialable on video now. Many actors have provided their voices for characters inthe film, most notable being Vincent Price, and include other well known British actors like Kenneth Williams, Stanley Baxter and Windsor Davies. I do have a lot more information on this film, so later on I might be able to provide a whole page dedicated to it.